Tom McSweeney kept his eye on the orange float as it bobbed gently in the slow moving stream, and the practised flick that cast it anew at the end of each pass was calm and unhurried, a picture of tranquil ease. And yet anyone who knew the old man well, anyone who understood his moods and temper, would have known he was troubled. Dermot would have understood, Dermot would have offered an appropriate level of gruff sympathy, and maybe a word or two of practical advice, before turning the conversation to the run of the river, or the flight of a bird, something that would have taken Tom’s mind from his troubles. But Dermot was no longer around. That’s the thing about death and friends, one minute they’re here and then they’re gone, and that’s it. No more Dermot. Tom’s friend had died at the turn of the year, and he’d left a hole in Tom’s life that just seemed to keep growing. Dermot had been more than just a friend. Since they’d first met at Dermot’s wood carving class at the local night school, Tom had grown to trust and respect the older man. Dermot had been an artist in wood. The leaping salmon he had shown Tom at his first class had been an inspiration. It was so lifelike you could almost see it breathe; the care that had gone into its crafting was apparent in every line, in each perfect detail of scale and fin. Tom knew he would never match it, but Dermot was encouraging and a good teacher, and their shared passions for carving wood, fishing and walking in the rugged Yorkshire hills had drawn them closer together, until the bond between them had become almost unbreakable. He missed him. Mary McSweeny bustled about in her spick and span little kitchen, sidestepping daintily between the suitcases and bags that littered the usually immaculate floor. for the sprinkling of grey, and the fine lines that wrinkled her face, by relieving her of some of the nervous tension that was still apparent in her daughter. The stress of the memory sent Maggie Coldwell rummaging frantically in her handbag for the cigarettes and lighter that she sometimes thought were the only things that kept her sane. She flicked the lighter viciously, and took a long, bitter drag on the cigarette, drawing the smoke deep into her lungs, and expelling it through her nose. Mary thought it made her look like a racehorse on a frosty morning. Before Mary could answer, the outer door was flung open, and Henry Coldwell carried in the last of the luggage his three children, Mary’s grandchildren, following glumly behind. Dan was still down by the river, although he’d given up the pretence of fishing, leaving the float to bob listlessly up and down where it had snagged against the opposite bank. He knew he should be heading back. Mary would be expecting him to be there to greet Margaret and the children and that fool of a son in law, but he wasn’t ready to face it yet. Dermot had loved this bend in the river and his spirit seemed to hover over the water. Tom could hear the calm familiar voice in his memory, and he found himself mentally discussing his problem with his old friend. The problem was the boy. It certainly wasn’t Margaret. Tom loved his daughter, naturally. And he was always pleased to see her, although he would admit, if pressed, to a smidgeon of disappointment that she had turned into an even worse chatterbox than her mother. Neither was it Henry the hopeless, who was a lost cause as far as Tom was concerned. Hopeless indeed, but more to be pitied than scorned. Nor was it the girls; who at the ages of seven and five still had their childish capacity to turn an old man into a doting fool, though even here he detected the first worrying signs of their female genetic inheritance. No, it was none of these. It was the boy. Even before the incident there had been a tension between them. They had circled each other like strange dogs; sniffy and suspicious. The eight-year-old had seemed sullen and awkward. It had appeared to Tom that he was determined to be as difficult as possible, and Tom had soon lost patience with the child, foolishly allowing himself to feel resentment at the apparent disrespect. So when Tom had gone to his workshop that day a year ago, after sending his grandson from the garden in disgrace for trampling on the flowerbeds, he’d found the door open and the sulking boy inside, moodily plunging Tom’s best chisel into the half formed salmon that lay gripped and helpless in the vice, he could no more have stopped the palm of his hand in its journey to the boys ear, than he could have turned the tide, however swift and heavy the regret he felt after. The boy had run howling to his father, who had comforted him, and looked at Tom with such unspoken reproach that Tom had found himself blustering in angry justification, until Mary had laid her hand gently on his arm, in a way that made him suddenly aware of how foolish he was being. He had retreated to his workshop to contemplate the damage to his work and begin the construction of the wall that had separated himself and the boy for the rest of the visit. Henry shuffled forward, hand outstretched. The handshake felt cold and distant, a formality to keep the peace. There was a moment’s awkward silence which Tom broke, muttering about the need to put away his fishing tackle, and heading for the sanctuary of his workshop. The boy was in the dining room. He had pulled a chair from the table and was straddling it, his chin resting on his arms where they lay crossed on the chair back. He was staring intently at an object that had pride of place in the display cabinet that stood against the wall. Tom felt a stab of irritation that he had not moved it to the safety of his workshop. The boy had heard Tom enter and he tuned his head to look, his expression guarded and wary. Tom nodded heavily. “Boy” he growled, he could think of nothing else to say. The boy turned back to his study of the object. “Is this what you were making when I did that stupid stuff?” he asked. The question caught Tom off guard, because it was Dermot’s salmon that sat in the cabinet; as it had since the day of the funeral when Sally, Dermot’s sister, had handed it to him. Tom’s forgiveness was instant and complete; he moved over and laid his hand softly on the boy’s shoulder, and together they admired Dermot’s skill for a moment or two. “Have you ever been fishing?” Tom surprised himself with the question, which seemed to have formed itself in the air. “No.” The answer was straightforward and without expectation. “Would you like to try?” The second question followed the first with the same lack of forethought. The boy’s head jerked round, his eyes flashing with excitement. “Yesss please!” Tom was surprised yet again. 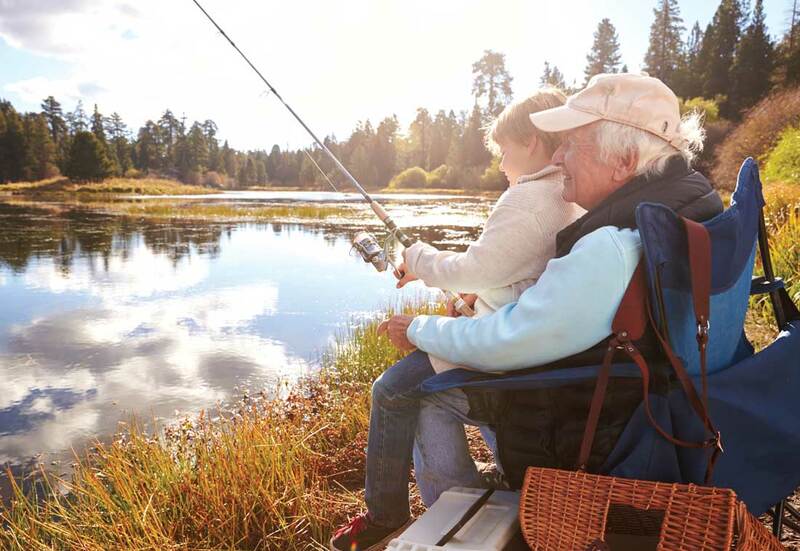 This time by the flush of pleasure he felt at the prospect of teaching his grandson to fish. For the first time since the death of his friend Tom found himself smiling, and as the door swing shut behind the excited child, he could have sworn he heard the gently mocking laughter of his old friend, echoing softly across the room.